flynas is a Saudi Arabian leading low-cost carrier with a fleet of 30 aircrafts, operating more than 1200 weekly flights to 35 destinations (domestic-international). Since its launch in 2007, flynas has carried more than 38 million passengers, a number that has steadily grown over the past 11 years. flynas offers its guests value for money with the best fares, on time flights and superior customer service which has seen flynas awarded the Middle East’s Leading Low Cost Airline from the World Travel Awards for four consecutive years (2015- 2016-2017-2018) as well as the prestigious Skytrax award for Middle East’s Best Low Cost Airline in 2017 and 2018.
flynas continues to grow and invest in its product with a recent agreement with Airbus to purchase 120 new A320NEO aircraft at a list value of US$ 8.6 billion. Mr. Bander Al-Mohanna is the Chief Executive Officer & Managing Director of flynas, a Saudi national air carrier and a leading low-cost airline in the Middle East. Al-Mohanna holds a Master’s Degree in Actuarial & Financial Mathematics from the University of Michigan as well as a Master’s Degree in Business Administration from the American University in Washington D.C. He has also obtained a Bachelor of Science Degree in Accounting from King Saud University, Riyadh. He is a member of CFA Institute and has also successfully completed an Advanced Management Program at Harvard University. Al-Mohanna has over 20 years of experience in leadership, finance and management across several sectors. He is a key member of flynas Group, responsible for the restructuring, financing and acquisition strategy of more than US $ 8 billion. Al-Mohanna joined flynas in 2006 as the Chief Financial Officer (CFO) and was promoted to Executive Vice President in 2008. In 2015, he was appointed as the Chief Executive Officer of flynas Group (flynas, NASJET, and flynas Hajj & Umrah). Prior to joining flynas, Al-Mohanna held several key positions, including Chief Financial Analyst at Makshaff Services and Investments Ltd. He also held several positions at the Saudi Arabian Monetary Agency, including the Banking Supervision Department between 1993 and 2002. Al-Mohanna also chairs and sits in the board of various prestigious business entities. 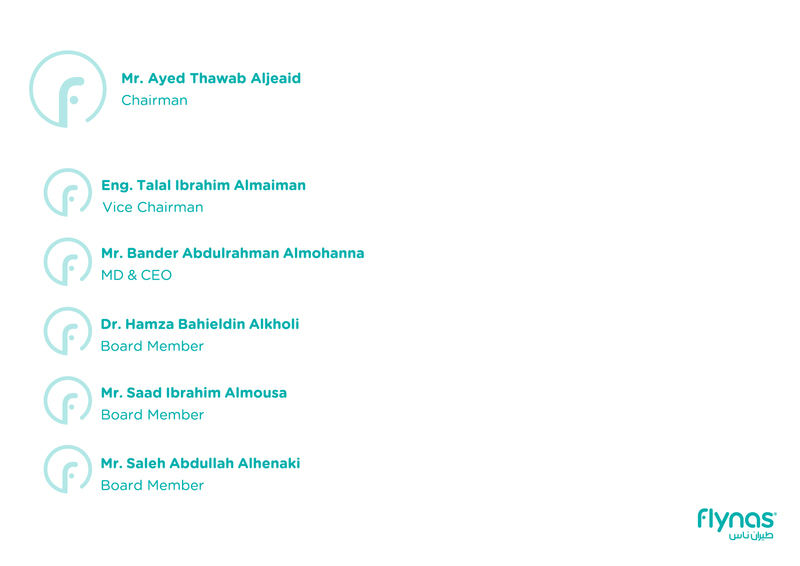 Al-Mohanna is also Chairman of Middle East Financial Investment Company (MEFIC) bank and JAZL Investments. He is a board member of several companies including Sabb Takaful, Nitaq Actuarial Services, NAS Execujet Services and Nas Holding. Mr. Bander Al-Mohanna, together with his team, has contributed to the success of flynas and led it to win several prestigious international awards, including the Middle East's Leading Low-Cost Airline from World Travel Awards for four consecutive years 2015, 2016, 2017 & 2018 and Skytrax Awards for Middle East's Best Low-Cost Airline for 2017 & 2018.